This Sunday, the SIMM Music Series continues with a stellar line-up: "The Josh Allen Trio" featuring the amazing guitarist Henry Kaiser, saxophonist Josh Allen, drummer Mike Guarino and the group Forward Energy, featuring Jim Ryan on alto & tenor sax, flute, trumpet, Outsound and Edgetone Record's founder Rent Romus on alto, soprano, & C melody saxes, Scott R. Looney on piano, Eric Marshall double bass and Timothy Orr on drums. This show is guaranteed to challenge the senses and push the musical envelope in ways rarely heard seen or heard. Josh Allen has created his own personal language on the tenor saxophone with an emphasis on polytonal and asymmetrical phrasing, as well as extending the range and sonic ability of the instrument. Allen does this with constant emphasis and study of the overtone series, and the generation of multiphonics from the application of this process. He is currently teaching Fellowship students at the Brubeck Institute at the University of Pacific. He was born in Berkeley, California in 1972. Like many of today’s prominent musicians, Mr. Allen was a product of the Berkeley public school system, studying saxophone starting at the age of nine under Phil Hardymon. He went on to study with such prominent Bay Area musicians as Bill Aron, Joe Henderson, and Rory Snyder. With his focus squarely on jazz composition and performance, Mr. Allen moved to Southern California in the early nineties to study with Rick Helzer at San Diego State. He became active in the Latin Jazz community, and worked with various musicians such as Dennis Chambers, and Eddie Palmieri. Allen returned to the Bay Area in the mid 90s to finish his Bachelors degree at Sonoma State. His subsequent association with saxophonist Marco Eneidi led to working relationships with musicians such as Glen Spearmann, Matthew Goodheart, Damon Smith, and eventually Cecil Taylor. Guitarist Henry Kaiser is a modern guitar icon, known for his collaboration with the Grateful Dead, among many others, as well as his own prolific and inventive compositions. Kaiser has helped unfetter the guitar from the conventions of genre-bound techniques, but his instrumental virtuosity and technological breakthroughs are always deployed in the service of deep and immediate personal expression. Likewise, he has developed a highly individual, inimitable style from an uncommonly varied range of influences. Some of his musical sources include traditional blues, East Asian, Classical North Indian and Hawaiian music, free jazz, free improvisation, American steel-string concert guitar, and 20th century classical, but like any probing artist he also draws creatively from other abiding interests, which for Mr. Kaiser include Information Theory, experimental cinema, mathematics, experimental literature and SCUBA diving. (He was employed for the last 15 years as a senior instructor in Underwater Scientific Research at the University of California at Berkeley. Sadly, Berkeley's excellent scientific diving program was terminated in the summer of 1996.) Kaiser's fabulous "Yo Miles" project with trumpeter Wadada Leo Smith has been perhaps one of the most ambitious and successful interpretations of the music of Miles Davis from the 1970s. Commenting on drummer Mike Guarino, Craig Matsumoto of "Memory Select Blog" wrote, "The drums — my god, the drums. I’d never seen Guarino play before, and he’s a monster. Big, loud, fast, precise..."
Forward Energy was founded in 1998 and had it’s first gig at Radio Valencia in San Francisco that year. The group has gone through several incarnations with top Bay Area musicians including: Eddie Gale of Cecil Taylor’s Unit Structures fame, Forward Energy has played up and down the West Coast as well as in the Midwest and New York City. The current formation includes founder Jim Ryan (who played on Steve Lacy’s weekly jam sessions in Paris during the early 70’s) on flute, saxes, and trumpet, and original member Scott R. Looney on piano. Scott received his BA in music from Coe College, Iowa and an MFA from Cal Arts. He has been a pillar of the experimental music community since the late 90’s. 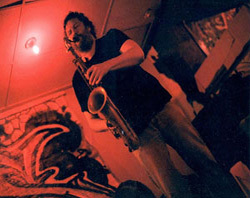 The group presently includes Rent Romus (who studied with Stan Getz and is a power both on his horn and as an organizer and promoter of the Bay Area experimental music community) on Saxophones; Eric Marshall is a regular bassist with Eddie Gale’s groups and he works in all genres of the jazz idiom. Percussionist Tim Orr studied with Ed Blackwell and plays all styles from zydeco to free jazz. Recordings of Forward Energy can be found on and also at www.cadencejazzrecords.com/albums/?album=786497526925 Cadence Jazz Records 1162.